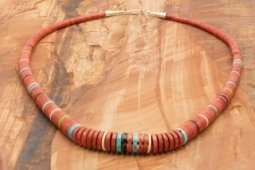 A Big Bold Necklace featuring Genuine Spiny Oyster Shell, Turquoise and Jet Heishi Beads with Pen Shel Heishi separating the beads. Each bead is cut, drilled and rolled by hand. Many hours of work went into the making of this beautiful necklace. Created by Master Santo Domingo Artist Ronald Chavez. The beads graduate from 5/8" to 1/4".